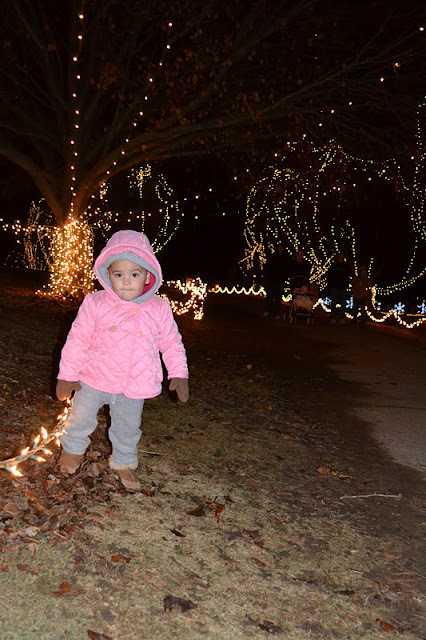 We were so happy to be able to celebrate Christmas at home again this year, but were even more excited that Grandma and Granddaddy, Lolli and Pop, Aunt Devin and Uncle Tony, and my Aunt Marilyn were all able to be here. 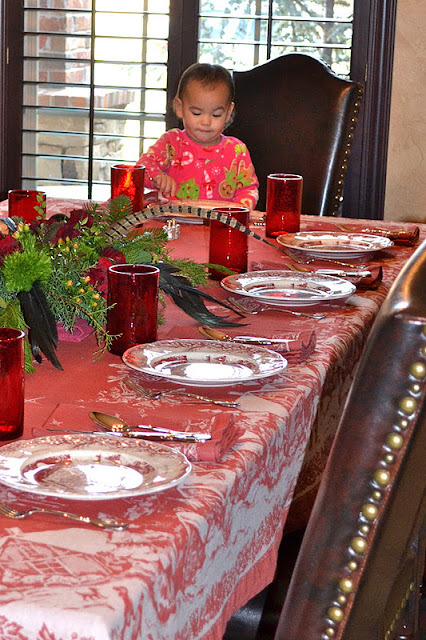 Since Layla and Jenna were the only children involved, we pretty much spent the day catering to their schedule. Rise and shine comes at about 8am for the girls, so like the good little elves we are, we had everything ready to go for them right off the bat. The tree all decked out before the girls discovered their loot. Santa left his gifts in the middle of the living room. 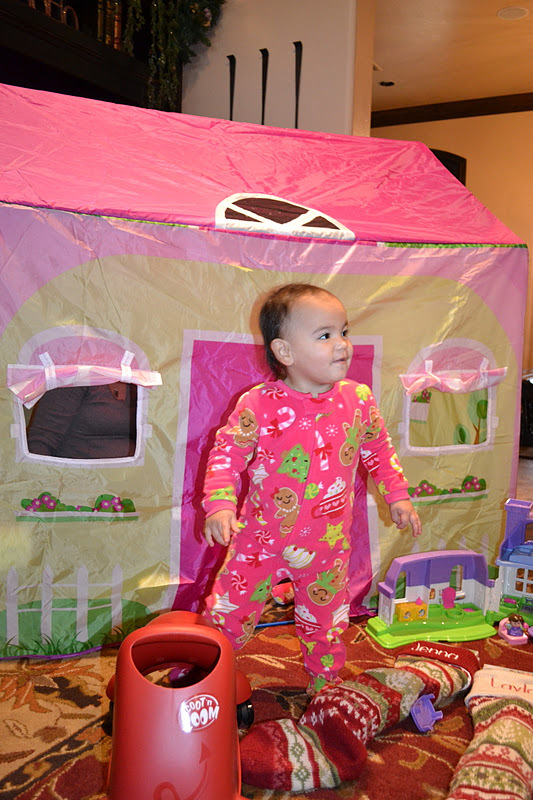 Apparently, Santa didn't pay close attention to the measurements of the play tent he brought. That sucker took up our whole living room! Here we go! "Whoa, sissy! What's going on out here!" Layla: "Seriously, people. Who dropped the house in the middle of the living room?" Sweet Layla ran straight over to her Santa gifts to check out all the goods. However, the stash under the tree caught Jenna's attention and off she went. Jenna: "Hey, this looks to be just about my size!" Jenna, you can open all that stuff later. Come see this cool house that Santa brought! The girls were a little hesitant so Aunt Devin (and her very pregnant belly) crawled in the there to help break the ice. That did the trick! Yes, Jenna crawled through the window. Layla: "Hey! I know these shapes! They're from my favorite movie!" Layla just loved the books that Santa left. 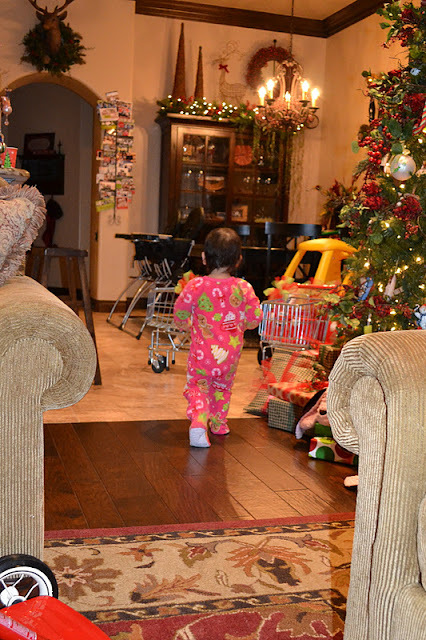 Jenna had her fun in the house and then headed back to the tree. Jenna: "OMG! My very own car!" Of course, it didn't take long before Layla realized the fun Jenna was having. Jenna: "I look good behind the wheel, don't ya think?" "These are just like the ones Mommy uses at Target!" Jenna was just making the rounds with all her new toys, meanwhile, I was successful in getting Layla back to focusing on the Santa gifts. Layla: "Awesome! New movies! I'll just load them right into my shopping cart." 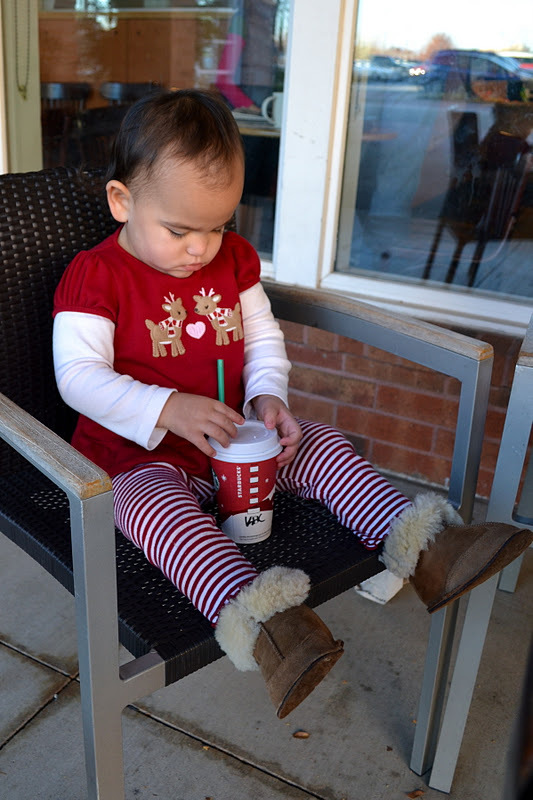 Layla: "A new Elmo cup?!?!?! This is amazing!" Layla: "What else is in that stocking?" Layla: "Sweet! A new pair of houseboots!" 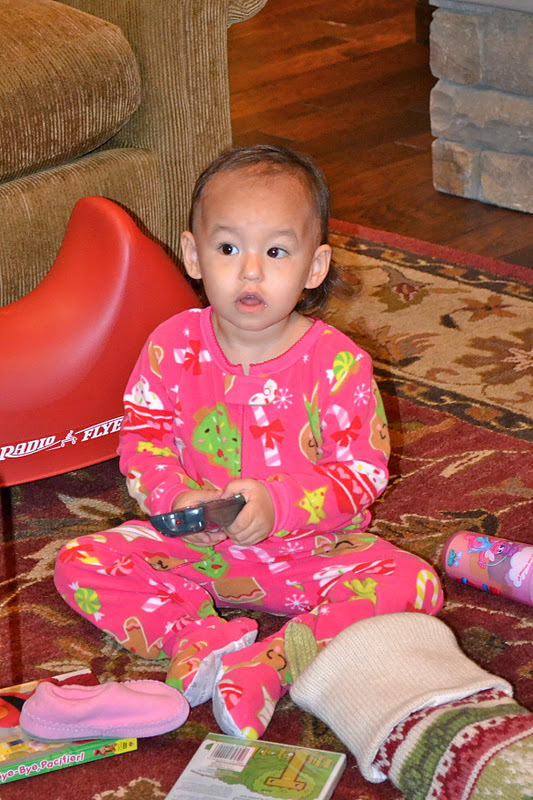 Layla: "Ooh, my very own remote control. Nobody better take this one away from me like they do the other." Layla: "And a jingle bell! Just like the ones at Gymboree! Where in world is sissy? She sure is missing out!" Figures. 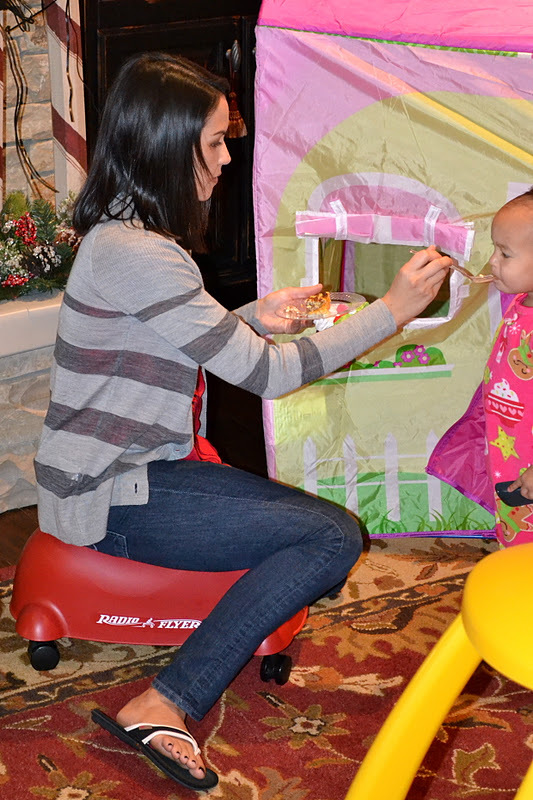 Jenna is busy getting her grub on with some yummy breakfast casserole. After she filled her tummy, I was able to lure her over to check out her new houseboots. 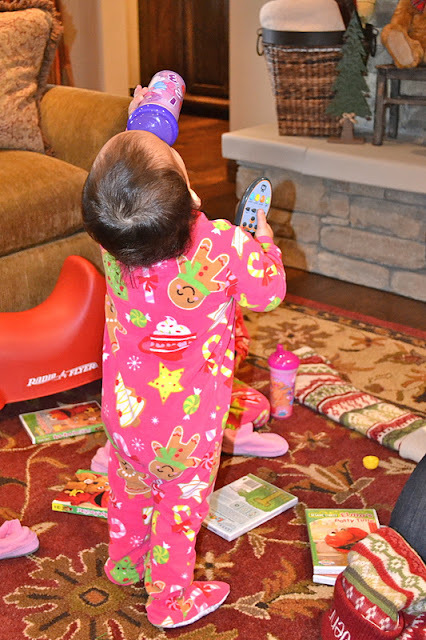 She was certainly digging her Elmo cup and remote control too! 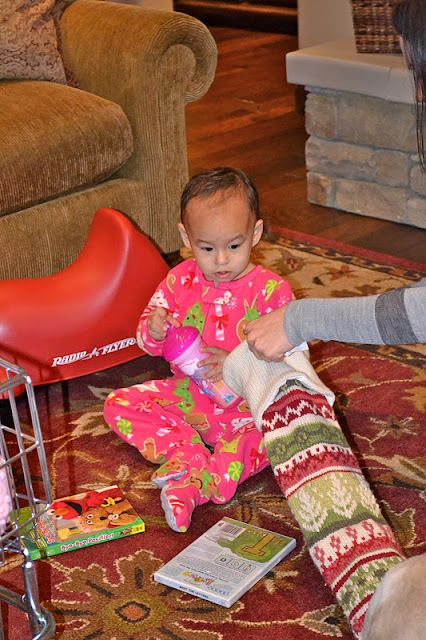 Layla worked hard going through all her Santa gifts. It was important to stop and get a bite to eat. Meanwhile, Jenna was ready to move on to the next meal. 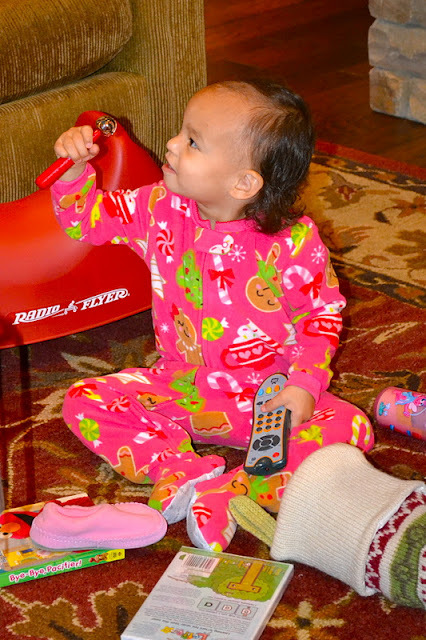 Getting through the Santa gifts took a good part of the morning. 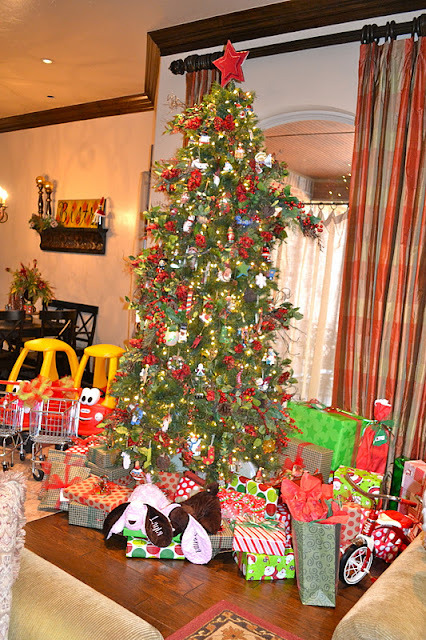 I'm sure you can imagine how long it took us to get through the rest of the presents. 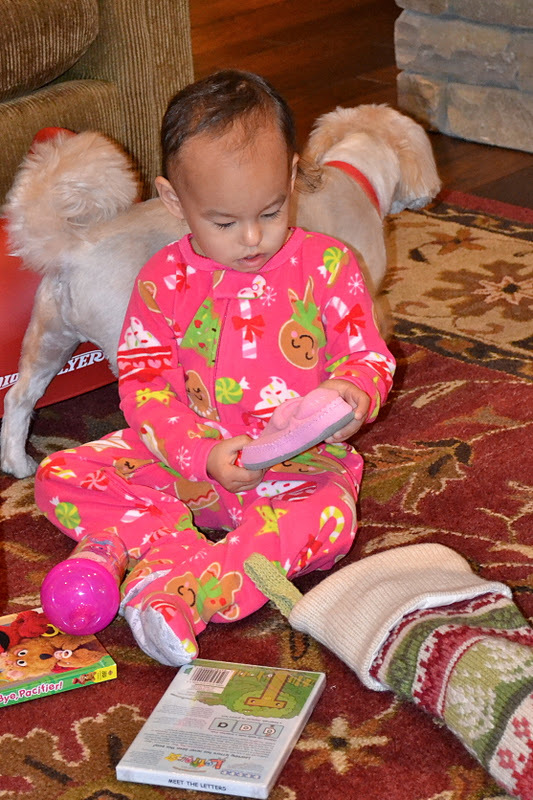 Layla and Jenna literally opened gifts all day long. When the girls went to bed, I opened 2 more of their boxes and then put 4 more in the closet to save for their birthday. It was a bit out of control, but so much fun! I'm a little overwhelmed by all the pictures we have of the gift opening session, so I'm posting just a few here in this slideshow for those who are so inclined to take a peek. What an amazing Christmas this was! 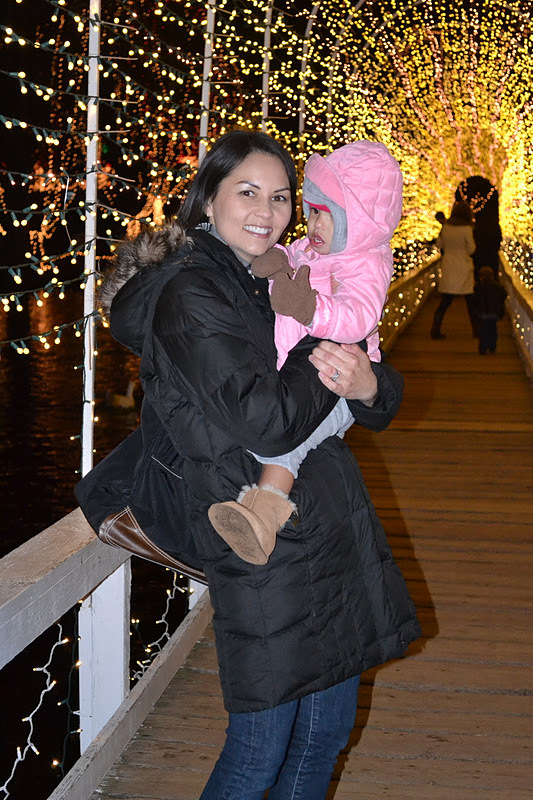 The best part was getting to spend the entire day with our family. We certainly missed seeing our Arkansas kin, but are so thankful for those who were able to make the trip, be it long or short. We love you all! 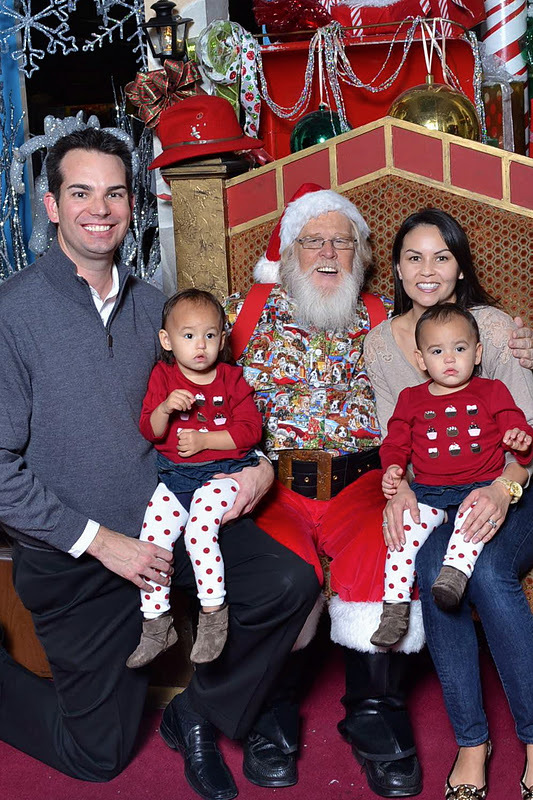 For our third and final attempt at a Santa picture, Trey and I took the girls to Sooner Mall to meet up with their ol' bud, Santa. 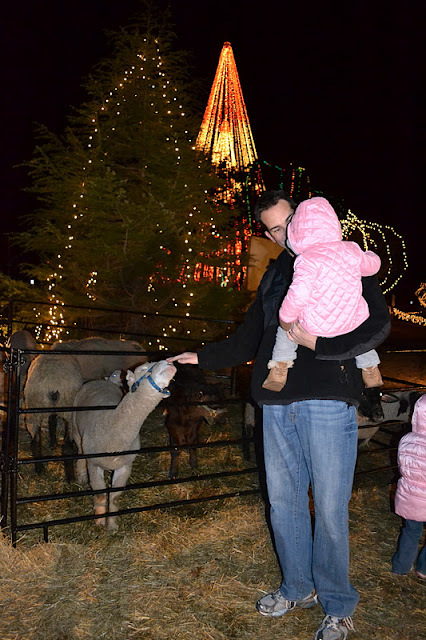 When we arrived, we learned that we were just 30 minutes away from Santa's dinner time. The elves had blocked off the entrance to his little piece of North Pole with a velvet rope and anyone who hadn't made it inside the rope at that point may or may not get to see Santa before dinner. We were second in line OUTSIDE of the rope. The deal was that IF Santa was able to visit with all the little kids inside the rope before 6pm, he would then accept visitors from the outside until time was up. We decided to wait it out...it was Christmas, after all, and miracles do happen, ya know? Well, to make a long story just a tad bit shorter, we made it with just 5 minutes to spare! While we were waiting in line, Layla and Jenna had a blast running 'round and 'round the North Pole. Whenever we could, Trey and I would catch them and try to get them to focus on Santa taking pictures with other little boys and girls. We were hoping that when it was their turn, they wouldn't be too afraid. Well, that didn't work. Once again, Trey and I succumbed to the pressure and put on our big smiles for the camera. 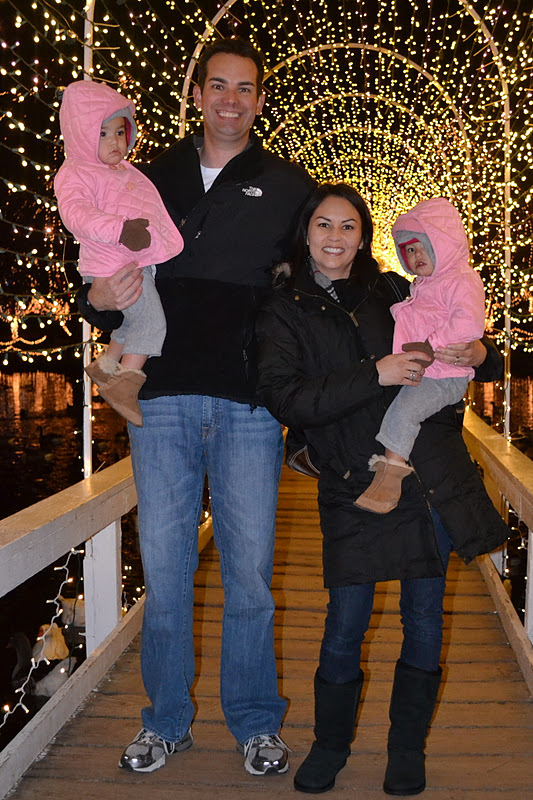 At least Layla and Jenna weren't crying this time...it was more of a reindeer in headlights look. Hey, that's progress! I'm really not used to NOT getting my way, but apparently, Layla and Jenna aren't either. I was bound and determined to get a "girls on Santa's lap" picture, but as it turns out, 2011 just wasn't my year. Until next year, Santa! Seeing how our first Santa encounter of 2011 didn't go over so well, Trey and I thought we would give it another shot. No, we generally aren't into repeatedly putting Layla and Jenna through traumatic experiences, but when it comes to Santa, the rules change. I mean, crying on Santa's lap is sort of a rite of passage don't you think? Besides...maybe they'd be fine this time. 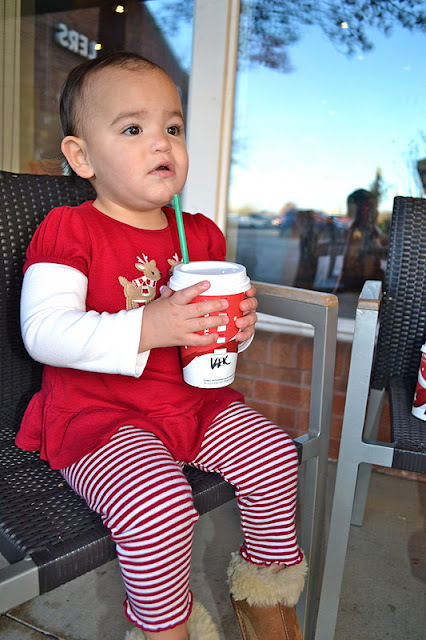 It was another lovely Saturday afternoon, so we loaded up the girls and headed to Brookhaven's Santa Day. When we arrived, there was quite a long line to ride in his sleigh, but Santa was chilling on a bench just waiting for the girls to run up and jump in his lap. Well, that didn't happen. As we were approaching him, it was becoming more and more apparent that this was NOT going to be an easy task. Santa had the grand idea for us to hold the girls facing away from him and then slowly back up toward him while he slipped in for the picture. Yeah, so that didn't work either, but here's what we got. "OMG, sissy! There's that man again!" Well, that situation seemed to stress the girls out quite a bit, so we decided to ditch the other Santa activities and head next door for Layla and Jenna's first Starbucks trip. While Daddy was waiting for L&J's hot chocolate order to be ready, the girls shared some gingerbread while listening to the carolers sing. "Hey! We know that song!" I'd like to think the girls have a pretty healthy diet...most of the time. They certainly get their fair share of treats, but when it comes to drinks, they only have milk or water and splurge on a cup of diluted juice just once per week. I was anxious to see what their reaction would be to a cup of hot chocolate. Jenna: "Did you say chocolate?!?!" Jenna is our "I'll try anything once" girl. Here she is checking it out. ...and this was the scene for the next 10 minutes. 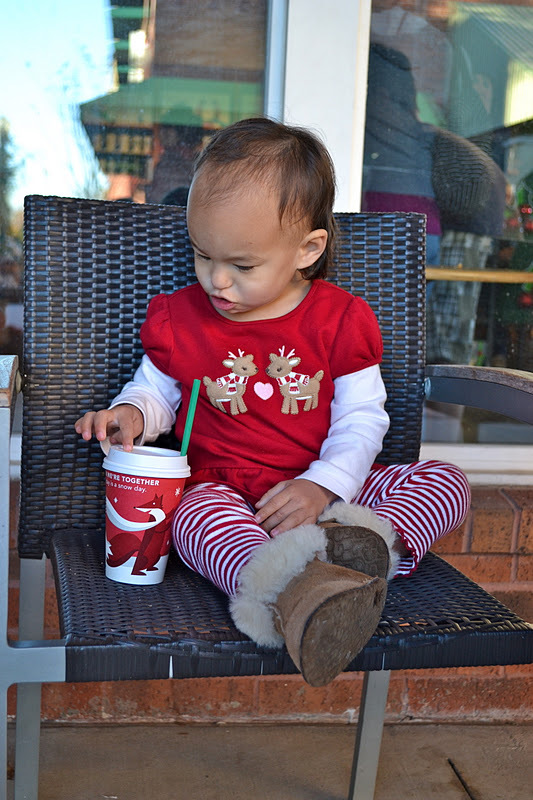 Layla doesn't always want to try new things, but after checking out the cup, she leaned over and took a sip. 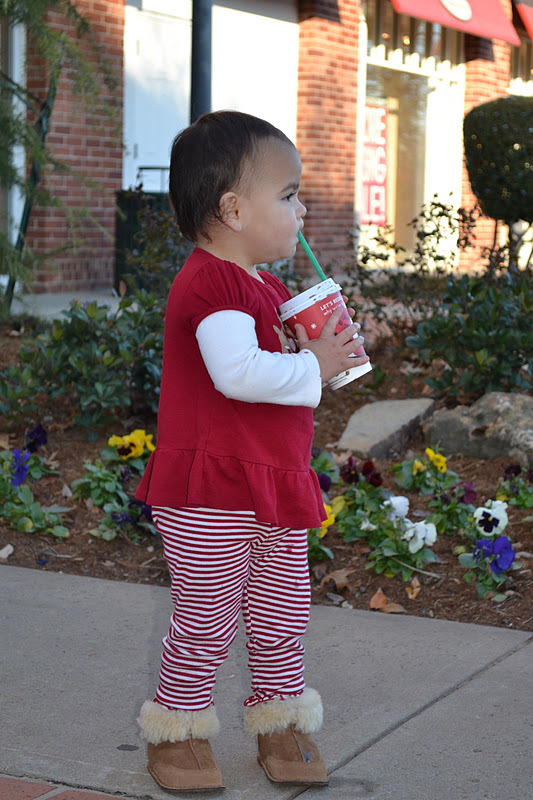 ...while Jenna went to get a closer look at the carolers (with hot chocolate in hand, of course). When she was all finished up, Jenna made sure to put the cup in the "tash". 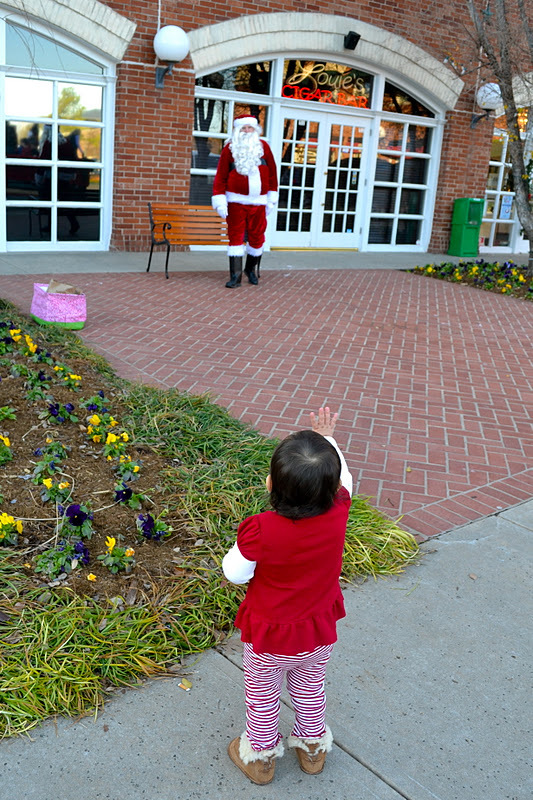 Layla made her way to the car and Jenna mustered up a little courage to wave at Santa. That sweet Santa tried one more time to win her over. Jenna really, really thought about it, but ultimately dissed him once again. I think if you were to ask the girls to choose between Santa and hot chocolate, Jenna would definitely choose hot chocolate. Layla, on the other hand, would probably just want to stay home. At this point, we are 0 for 2 in the Santa department. Don't worry...we shall try again. 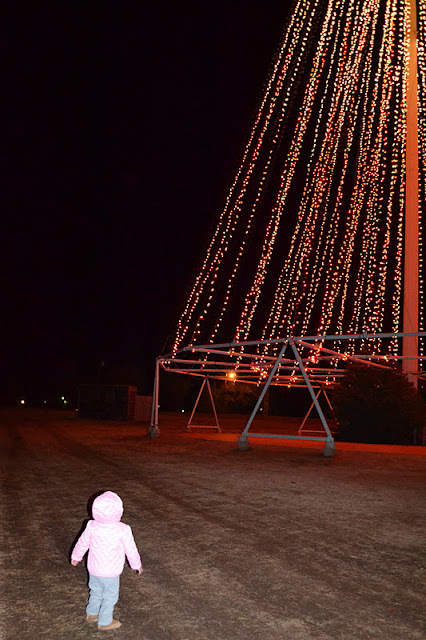 During the last several weeks of every year, the city of Chickasha puts on a ginormous light display called the Festival of Light. It really is a sight to see, but the coolest thing about the whole thing is that it's made possible solely through donations and volunteers and it is FREE to the public! 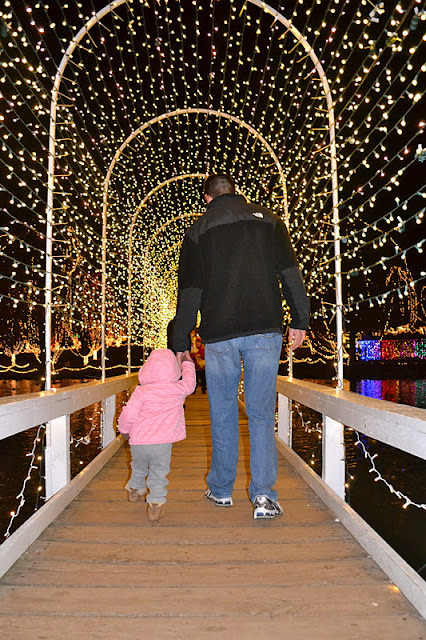 If you're an Oklahoman, chances are, you've been to the Festival of Light once or twice before. Trey and I have been several times, but 2011 was the first year that Layla and Jenna got to experience its beauty. Checking out the grounds when we first arrived. Layla: "Wow! That tree is taller than my Daddy!" I just had to take our animal lover on a camel ride. 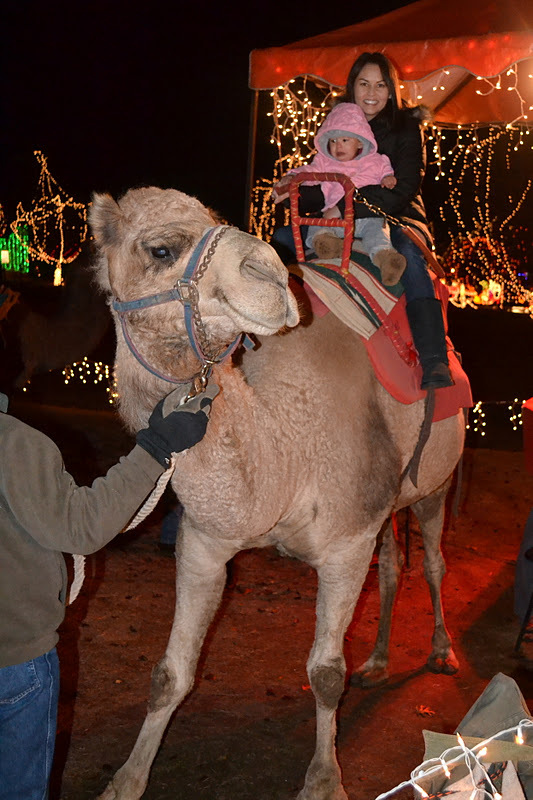 I know it doesn't look like Layla is enjoying herself, but she really was fine once the camel got going. Jenna preferred to just look at the animals with Daddy. No camel ride for her! The light-covered bridge is one of my favorite spots every year. Apparently, it's a popular spot for marriage proposals. In fact, we got to witness one that night! Come on, Layla...just take one picture with Mommy! I really don't like bothering people by asking them to take our picture, so I'm always thankful when someone offers on their own accord. It's always nice to get a picture with everyone in it...they are few and far between! Jenna: "Come on, Daddy, let's go." 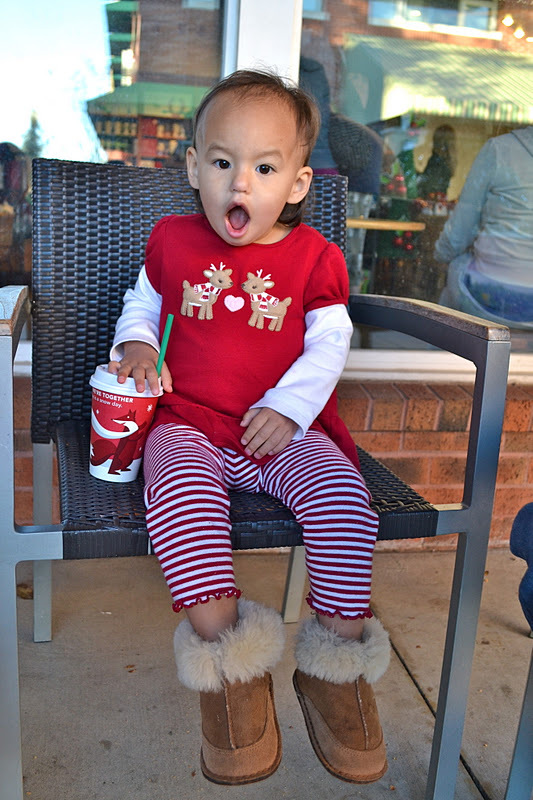 Layla: "Wait a minute! Let's check out the ducks!" "Ooh, sissy! Look how beautiful!" Layla: "Look up, Daddy! Isn't it amazing?!?!" Jenna: "Dare me to step over the strand???" Time out for a little sisterly love! We ended the night with a horse drawn carriage ride. Jenna needed to get better acquainted with the horses before boarding. Layla: "Ah man! Not another picture, Mommy!" Whoa! Two family pictures in one night? That's a record! Thank you to the nice family in front of us! 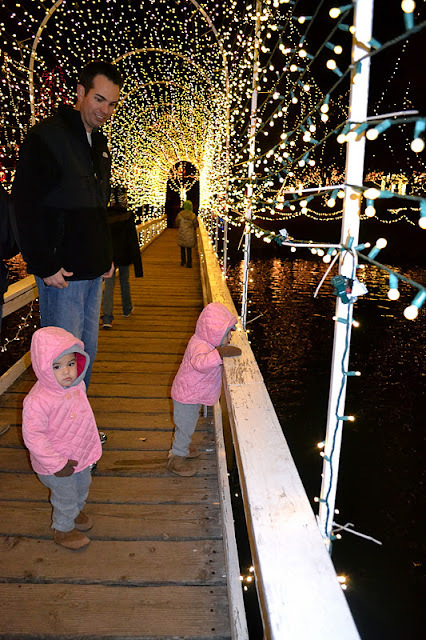 Layla and Jenna had such a magical night under all those lights. It was definitely worth missing bedtime by an hour and a half. I think making the trip to Chickasha will be a family tradition we uphold for many years to come! I'm Back (and Backed Up)!